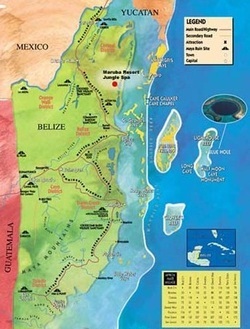 General Information About Belize "Our Belize Vacation" - "Our Belize Vacation"
An adventure's paradise, Belize is a peaceful, English-speaking country just two hours away from 3 major U.S. Gateways. With a diversity of adventure opportunities unmatched by any other country, the Belizean people have protected over 40% of the country as parks and natural reserves. Belize is on the Caribbean coast, nestled between Mexico and Guatemala and offers an intriguing mix of tropical forest rich with wildlife, majestic mountains, mysterious Mayan temples, diving and fishing experiences beyond comparison. In a single day, one can go from tropical forest to the longest barrier reef in the Western Hemisphere. POLITICAL STATUS - Belize has been an independent nation and a member of the British Commonwealth of Nations since 1981. Belize is governed by a parliamentary democracy with two major political parties, (1) the United Democratic Party (UDP) and (2) the People's United Party (PUP). The Belizean constitution is similar to documents adopted by other former British colonies and includes a bill of rights. GOVERNMENT- Belize has a parliamentary form of government. The legislature, called the National Assembly, consists of the House of Representatives, with 28 elected members, and a Senate, with five members named by the prime minister, two by the opposition leader, and one by the governor general. Internal self-rule was achieved in 1965, under Prime Minister George Price, whose Peoples United Party held firm control of the house of Representatives for almost twenty years. In 1984, in a stunning turnabout, Belizeans voted into power the United Democratic Party, headed by Manuel Esquivel, whose policies were somewhat more pro-Western and business-oriented than those of his predecessor. Price and the Peoples United Party returned to power by a small margin in September 1989, under the slogans as "Belizeans First", "Belize for Belizeans", and "Belise is not for sale." Local government is in the hands of elected councils. The judicial system operates on the basis of statutes in comparison with their Central American neighbors. LANGUAGE- English is the official language of Belize. So you will not have any trouble communicating while in Belize. Most Belizeans speak English and Spanish. A dialect of English known as Belizean Creole is widely spoken through the country. Other languages spoken include Carib, Mayan, and Spanish. ELECTRICITY - The electricity and electrical outlets in Belize are the same as the United States using 110 volts/60 cycles. Although in some of the more remote locations, diesel generators supply the sole means of electricity. A small surge suppressor is highly recommended for computers and other sensitive equipment. Visitors from countries such as Australia and Europe should bring power adapters. CURRENCY - The Belize dollar is tied to the U.S. dollar and exchanged with most merchants at a fixed $2.00 (BZ) = $1.00 (US). When exchanging money in the banks, Central Banking rates apply. U.S. dollars are accepted almost everywhere. There is no need to exchange currency before arriving. Most places accept U.S. dollars and major credit cards. However, some merchant accounts charge between 4-5% processing fee for credit cards, used outside of the county of issuance. Belizean banks cash travelers checks, give cash advances on Visa and Master cards and have wire transfer services. In addition, Belize has five commercial banks: Belize Bank, Alliance Bank of Belize, Atlantic Bank, First Caribbean International Bank, and Scotia Bank (Belize). ATM machines are located countrywide, but few accept debit cards form US banks. FOOD - Most restaurant cuisines carry a Caribbean flare. You can find anything from stewed chicken, rice and beans to tropical salads, steaks, seafood and fruit plates. CULTURE - Belize is a country of various cultures, languages, and ethnic groups. Approximately, the 270,000 people who live in Belize consist of Creole, Garifuna, Mestizo, Spanish, Maya, English, Mennonite, Lebanese, Chinese and East Indian. Due to the racial harmony and religious tolerance, all of these different elements have mixed and blended successfully, and Belize has gained a widespread reputation for its friendly people. THE PEOPLE - Belize is small, but its population is minuscule, even for a country of its size. With all the available elbow room, several ethnic groups have been able to maintain their separate identities. The different peoples of Belize eat, think and dress in their own ways. Even the houses of one group differ from those of another. How did they all get here? Ancient Mayan civilizations made up the majority of many family lineages, going back thousands of years. The quest for discovering new land, brought the Spaniards looking for gold and other valuables, which was then followed by the pirates. When countries began to crack down on piracy, many pirates became wood loggers. In time, Baymen (or wood loggers) settled in Belize and intermarried with Mayan women. Because logging is labor intensive, the Baymen needed slaves to keep their operations going and this brought slaves from Africa as a result. African heritage predominates among Belizeans, followed by American, Eastern India, and European. According to the 1980 census, 40% of Belizeans are Creoles, 33% are Mestizos, about 10% are American Indian, or Mayan 8% are Garifuna, and 4% are white. The remainder are of some other descent, including East Indian, Lebanese, and Chinese. RELIGION- More than half (60%) of the people are Roman Catholic, and many of the remainder are Protestant. The country's Mesitzos, Maya and Garifuna are predominately Roman Catholic. Many Creoles also practice Catholicism, but the majority of Creoles are Anglicans, Methodist, or other Protestants. Belize also has a small Mennonite population as well. EDUCATION - Education is compulsory for children between ages of 5 to 14. Attendance at primary schools was nearly universal in 2002-2003, but only 78 percent of children of secondary school age were enrolled in school. There are nearly 200 primary schools, 22 secondary schools, and a teacher's college. The Belize literacy rate is over 90 percent, one of the highest in the area. Most schools are ran by churches, some by the government. All schools are regulated by the government. The government maintains one special school for mentally handicapped children and another for children with physical disabilities. The keel-billed toucan (Ramphastos sulfuratus) is recognized for its great, and brightly colored canoe shaped bill. It is about 20 inches in leght. Toucans are found in open areas that have large trees. They like fruits and cut them with the serrated edge of their bills. They nest in holes in trees and lay from two to four eggs which are incubated by both parents. The mahogany tree (Swietenia macrophillia) grows to a height of over a hundred feet from great buttresses at the roots. It is an important part of our history and a part of Belize's Coat of Arms. The tree has small, whitish flowers and dark fruits which are pear shaped. The ripe fruits fall on the shaded protection of the forest floor and germinate to begin a new cycle. The mahogany tree matures in 60 to 80 years. The black orchid (Encyclia cochleata) grows on trees in the damp areas of Belize. It flowers nearly all year round. It has greenish-yellow petals and sepals with purple blotches near the base. One of the petals is deep purple-brown, almost black, with distinct purple veins. The tapir (Tapirus bairdii) is the largest land mammal of the American tropics. It is known in Belize as the mountain cow. The tapir is a stoutly built animal with short legs and weighs up to 600 pounds. It is dusty brown in color with some white patches. The tapir is a vegetarian. It spends much time in the water and it is a strong swimmer. The red, blue and white flag of Belize is a symbol of unity. The Belize flag is royal blue with one horizontal red stripe at the top, and the bottom and a white circle with the Coat of Arms in the centre.